Congratulations to Facebook's Michelle Wang, she was drawn from a 491-participant-lucky-draw to be the winner of Fairchild Radio's March Social Media Game. 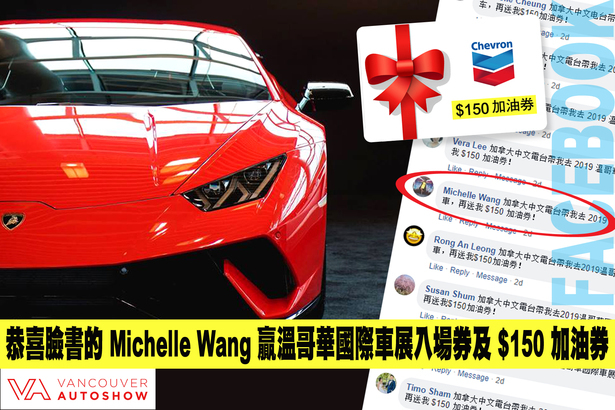 She will take home 4 general admission tickets to the 2019 Vancouver International Auto Show, plus $150 Chevron gift certificate. The prize package valued at $230 is sponsorsed by Vancouver International Auto Show! The 2019 Vancouver International Auto Show will take place at Vancouver Convention Centre West from Mar 19 to 24. Visit the official website https://vancouverinternationalautoshow.com/ for more information.